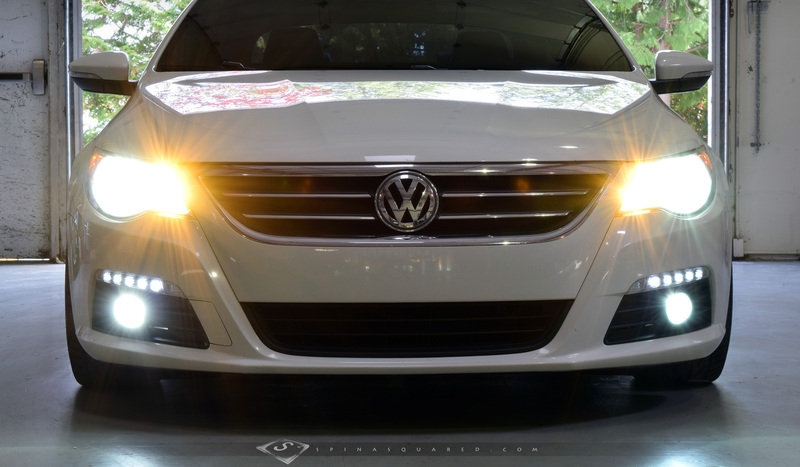 The journey continues with our 2010 Volkswagen CC. It’s getting to be 4-years old and we’ve managed to rack up just over 70,000 miles already as it serves as a daily driver and is our preferred mode of transport wherever we go. Our favorite VW model to date continues to turn heads and maintains it’s appeal despite there being a two year old “face-lifted” version. The upgrades have held up well and the car is a complete joy to drive. This CC is a keeper! For about a year since our last update on the CC very little has changed. Two pair of ion yellow H7 bulbs were sourced and shipped over from Okinawa (“Arigato!”, Steve and Erwin) to replace the original cornering and high beam bulbs in the CC’s headlight housings, finally ridding us of their weak halogen light output. The LED license plate bulbs we picked up a while ago were ditched for a pair of factory LED-equipped license plate bulb housings from Volkswagen’s (Mk6) Golf R. In early December, APR released their iPhone mobile app and Bluetooth dongle then just last month their DSG TCU upgrade was released so it was only natural to add those to the on-going roster of APR performance upgrades from Achtuning. A few weeks ago the CC was on the rack at Achtuning receiving an APR Intercooler. It appears the pace is picking back up and now there’s no sign we’ll be slowing down any time soon. Oil consumption issues that are plaguing Volkswagen’s FSI and TSI engines means the CC is due for a “carbon clean” so there’s some maintenance to be done first. We’ve also seen the all too common ignition coil failure a few times so extras are kept in the trunk now. The tires around the 19″ Hartmann Euromesh 3s are also new. A big “Kamsamnida!” to Jae at Hankook Tire in Lynnwood for the new set of Ventus V12 evo2 tires, a much quieter and softer compound compared to the previous Falken tires and an over-all improvement. Future plans include Ground Control camber plates for the front suspension and an APR turbo upgrade. In the coming weeks there will be a bigger focus on “dressing up” the engine bay, interior, and trunk in preparation for the 2014 show season already under way. (More on that in our next entry.) While we are completely satisfied with the factory interior a few subtle changes need to be made to help differentiate this from any other CC that rolled off the showroom floor. The goal of course will be maintaining a clean, OEM+ look without going over the top. We will be sure to keep you updated with these new changes so stay tuned!